Chaker Hanna was born and raised in Lebanon until his relocation to Sierra Leone during the Civil War. He was educated in both Lebanon and France achieving five ‘A’ levels, 7 GCE ‘O’ levels plus additional managerial qualifications including finance. Chaker’s first business was a patisserie, which was launched at the age of 22. By 1986 he had re-located to London and became a British national. Married with twins, who are both 29, Chaker has a strong family unit where they reside in Chislehurst. 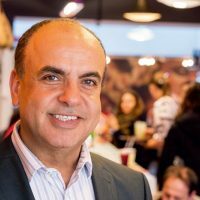 During his 30 year career in England, Chaker has progressed from Catering Assistant to Chief Executive Officer. By 1997 Chaker became the Managing Director of Brinker UK Ltd and remained there for 12 years offering strong leadership skill and proven strategic planning. In 2010 Chaker joined The Levant Group as Chief Executive Officer. Under his guidance the Company has expanded from four restaurants to 16 with another 10 in the pipeline, which will all come to fruition over the next 18 months.